I'll need to research my goals for last year and see how bad I failed on them, and probably have a recap soon, but let's have a box break today here. From the same site I picked up my Black Friday Golden Age boxes, that yielded a sweet Yogi auto, they were selling 2008 Goudey hobby boxes. Any chance I find Goudey in dime boxes, or loose packs here and there, I will scoop them up. So to find hobby boxes available for a touch over $30, that's a no brainer to put in a purchase. I prefer the '08 release over '07 and '09, but would love to find those two sets as well. But with two hits per hobby, an auto and an relic, I still desired to rip a box. And I'll probably rip a couple more. In case you forgot what the set looked like, it was a full sized homage to the 1934 set put out by Goudey Gum. Similar look to the player's likeness, the silhouetted figured in the background, and the "Lou Gehrig says" replaced by Jeter and Griffey, though they got the wrong image on the Longoria card. The initial set is 200 cards. Cards 201-330 are all short printed in different insert sets. The first 30 are retired players. 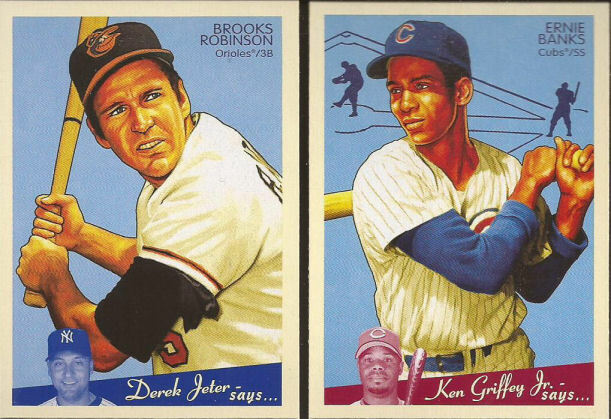 I pulled two with the Robinson and Mr. Cub. You can see the correct Junior image on Ernie's card. Beyond 230, you have Presidents from 231-250 (I got 2), black and white 1936 Goudeys from cards 251-270 (I also pulled 2) and then the Sports Royalty set from 271-330. Black backs run to 300 and then green backs to 330. The green backs are a difficult pull, but that Bo is one of them. I pulled 4 black backs. Of course, they have to mini everything. I didn't bother scanning the minis of the base set. 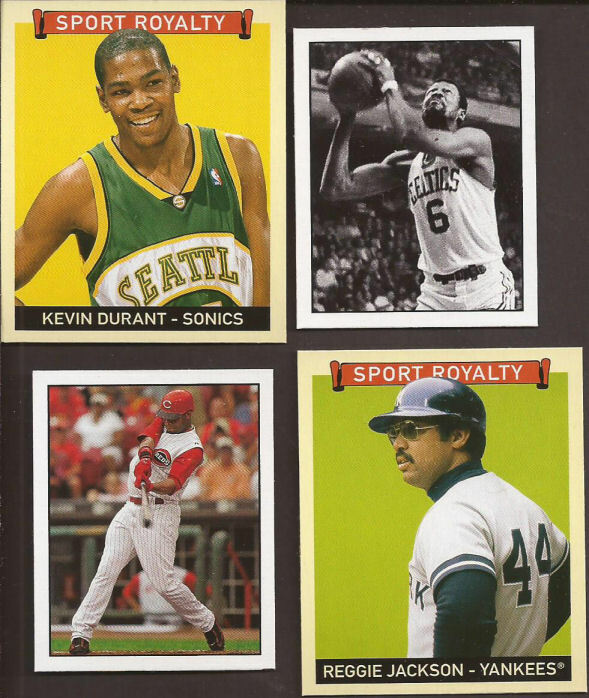 Here's a couple Sports Royalty minis in Durant and Reggie. Bring back the Sonics. I also pulled a couple of the Hit Parade of Champions. It's a 30 card set, so you would need 15 good boxes to build the whole thing. But that set is based on the 1951 Berk Ross multi sport set. Here's my two hits. Hmmmmm......I wonder where the autograph will end up? 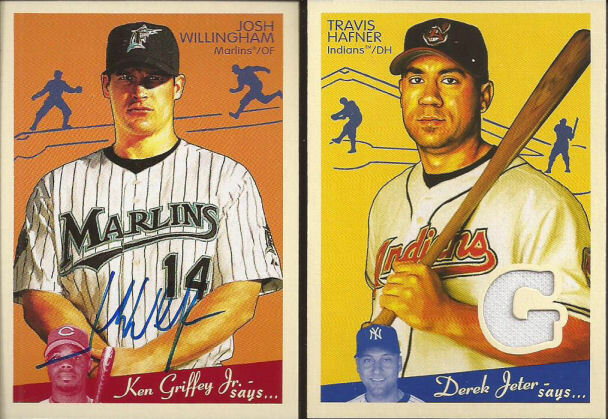 Hafner was in a lot of mid to later 00's sets. He would kill the Sox each year. Hated the guy. Still do. BAM!!!! YAY BABY! In random boxes are buybacks of actual 1934 Goudeys. I was afraid they would be redemptions, and as such, long expired. What a surprised to have a pack with a penny sleeve and this beauty within. The back is in perfect condition - no paper loss at all. You can see the slightly damaged corners. I have a feeling a previous owner used photo corners to hold this in an album. 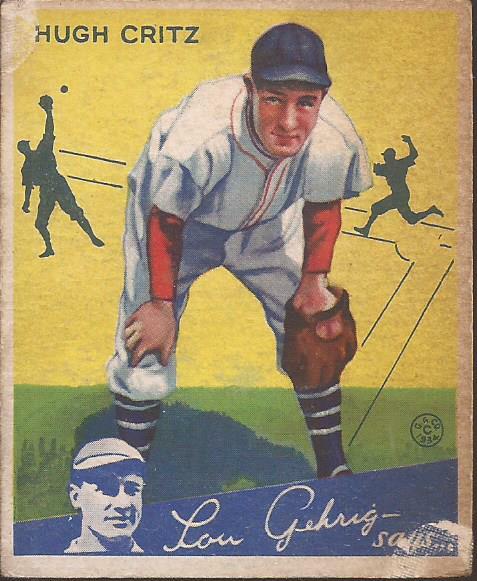 Other that that, and the slight discolorization on the right side, this is the finest Goudey I own. Critz put together a 12 year career with the Reds and Giants at 2nd base. A lifetime .268 hitter, he finished 2nd on MVP ballots in 1926 and was with the NY Giants when they won the championship in 1933. I'm at 84% of the 200 card base set, but would love to secure as much of the SPs as possible. With a nice surprise from my in-laws, I believe 2 more boxes of this will be coming my way. Overkill? Maybe. When has that stopped any of us? 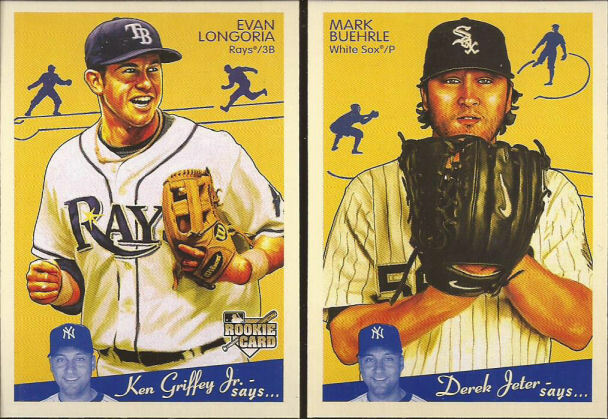 Sweet that you got an actual Goudey! Awesome pull on the Critz card. Nice buyback! I've busted a box of this stuff a few years ago. Fun break at a reasonable price. Happy New Year! Woah - excellent pull with the Critz. Just wow! Nice.. That Urge Overkill album is an all-time favorite of mine. why have I never pursued this set? Critz was a handsome pull - congrats! way cool!